The first tourists have appeared in the Chernobyl zone after marauders in the mid-nineties when radiation level has seriously fallen and all valuable things were taken out and sold. In 1995 the Agency of information, the international cooperation and development "Chernobyl interinform" — the state enterprise of the Ministry of Ukraine concerning emergency situations and concerning protection of the population against consequences of the Chernobyl accident was created. The organization of trips to the Chernobyl zone was one of the purposes of the agency also. The department of international relations and development was engaged in it. Later a number of companies have appeared. They organized excursions to the Chernobyl zone in cooperation with "Chernobyl interinform". In 2002 there was a report of the UN according to which it was possible to be in the majority of places of Pripyat and Chernobyl zone without special harm for an organism. Since then the number of tourists who visit Pripyat and want to have a trip to Chernobyl has grown up 1-1,5 thousand people. In 2007 there was a computer game "S.T.A.L.K.E.R. ", which also promoted an increase in number of tourists coming to the Chernobyl zone. In 2009 Forbes said that the Chernobyl NPP was the most "exotic" place for tourism on Earth. In 2010 the decision to open the Chernobyl zone for all comers was made (before this time a visit to the zone was limited). By the order of the Minister of Emergency Situations of Ukraine Victor Baloha radiological researches have been conducted, cartograms of radiation levels on the basis of which zone routes for visitors have been created. Results of researches have shown that in the territory of these routes it is possible to be in a 30-kilometer zone till 4-5 days without any harm for health, and without any harm for health it is possible to be1 day in a 10-kilometer zone. In December, 2010 there was an order of the Ministry of Emergency Situations which approved new rules of visit of the Chernobyl zone for citizens ofUkraine, foreign delegations and certain foreigners and also rules of radiation safety which should have been observed at visit of the Chernobyl zone. On February 2011 rules were registered by Ministry of Justice of Ukraine and in March began to work. According to the new program visit Pripyat and a trip to Chernobyl became possible. But in June, 2011 the access for tourists to the Chernobyl zone was closed again. 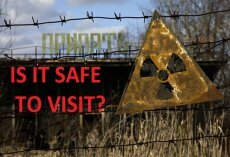 Since June 23 trips to the Chernobyl zone through tour operators have been temporarily stopped by order of the Ukrainian authorities. The Ministry of Emergency Situations has commented on the fact that the State Office of Public Prosecutor has given a protest on the order of the Ministry of Emergency Situations which has approved an order of visit Pripyat and a trip to Chernobyl. The Ministry of Emergency Situations thought this order was lawful. The court had to pass the decision on this dispute. In September, 2011 the Chernobyl zone was finally closed for tourism. As one of the reasons of closing of excursions officials called that the money gained from tourists wasn't spent for assistance to the affected area. According to the decision of District administrative court of Kiev, the order of the Ministry of Emergency Situations has been recognized as illegal. The Minister of Emergency Situations has refused to have legal proceedings with prosecutor's office and has issued the new order taking into account her wishes. In November V. Baloha has declared that after registration of the new order the zone has to be opened for tourism again. OnDecember 2, 2011 the Chernobyl zone became available to visit in the fact-finding purposes again. Under the new order, rules of visit have been back toughened and access to the Chernobyl zone is limited: "For scientists, experts, journalists, the international control and monitoring will remain further available. Just the regulations of visits became more exacting" explained V. Baloha. In 2013 a process of liquidation of Chernobyl interinform agency was begun. In the middle of 2013 the agency wasn't engaged in registration of access to the Chernobyl zone but only owned a Chernobyl hotel. In autumn the Chernobyl interinform agency was finally liquidated. At present obligations of agency are carried out by CSC (Chernobyl Special Combine). In 2014 there were film series "Chernobyl: An exclusion zone" that has once again promoted promoting of tourism in Chernobyl zone.